Trelleborg is a leading supplier of vibration control solutions for rail systems and now offers LH embedded rail solutions with advanced polymer technology for the construction of urban railway and metro networks. Based in Brisbane, Australia, we manufacturer engineered rubber and polymers used in industrial solutions. Focusing on the infrastructure construction and the major tansport sectors of shipping, air and rail, Trelleborg uses a range of polymers, metals and composites to provide solutions that damp, seal and protect demanding environments. Our range also includes primary suspension and anti vibration solutions for rail associated rolling stock. Trelleborg is a specialist in the design and manufacture of products to reduce and mitigate low frequency vibrations that contribute to a noisy environment and uncomfortable ride on trains and trams. Our new high-performance polymers now make it possible to construct embedded rail track with very high vibration isolation performance together with excellent electrical insulation to protect against the problems of stray current. Trelleborg is also able to offer superior performing ‘pour in’ polymers that allow seamless expansion or contraction between concrete and steel structures. Our team in Australia are dedicated to servicing the ANZ and SE Asia regions, and making it a global centre for contactors and consultants for heavy haul rail metro and city light rail solutions. Recent advances in high-performance polymers have opened up the possibility to construct embedded rail track with very high vibration isolation performance and good electrical insulation. Vector is such a system, based on a unique combination of a pre-moulded elastomer boot fitted to the rail over an optional inner electrical insulation coating applied to the rail. This approach ensures that Vector can reliably deliver the most stringent electrical isolation requirements for a modern light rail system as well as provide robust and durable rail fixing. The ability to tailor the rail boot design and easily adjust material properties allows Vector to rival the vibration isolation performance of floating slab track while offering much lower construction costs for both light metro rail and heavy haul rail track. Vector can be installed using a range of track constructions including Trelleborg’s own non-metallic sacrificial installation beam system proven on the Gold Coast Rapid Transit project. The system can also be applied in association with bi-block sleepers to produce a shallow track construction. Successful installations have been made over the past ten years in the UK, Europe and South Africa with most recent installations in Milan, Durban, Manchester and Birmingham. Trelleborg is a worldwide business which has some 140 manufacturing facilities and 22,000 employees worldwide, so we are able to draw on a global in-house expertise to ensure the minimum of risk to your rail sector requirements in the region. Trelleborg will be exhibiting at the Ausrail Show in Sydney, which will be held 26-28 November. Trelleborg ATP-DR Ballast Mats are produced from natural rubber elastomer, which is specifically selected to produce required performance characteristics. 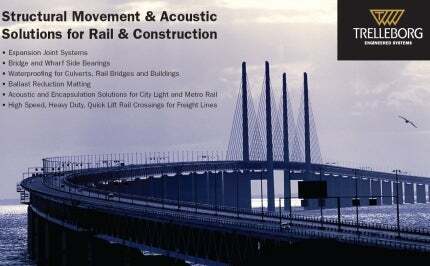 This white paper discusses Trelleborg's range of solutions to counter noise and vibration issues for rail infrastructure. Inland Rail is a proposed freight rail corridor between Melbourne and Brisbane that will further connect south-east Queensland by rail with Adelaide and Perth in Australia.